For Banjo. 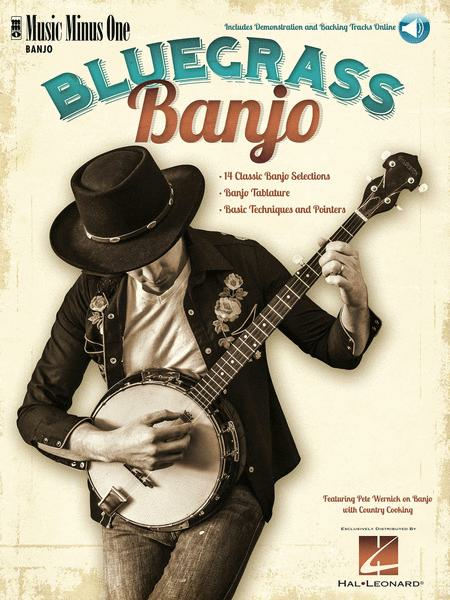 14 Classic banjo selections are included in a 24-page booklet with banjo tablature plus basic techniques and pointers for playing bluegrass banjo. Includes a compact disc with all 14 selections in split-channel stereo, with the banjo part on the right channel for easy removal: the left channel contains the accompaniment minus you, the soloist. Published by Music Minus One. This album, filled with some of the greatest banjo classics, is designed to help musicians develop basic bluegrass techniques, based on the styles of groups such as Bill Monroe and the Blue Grass Boys, Flatt and Scruggs, the Foggy Mountain Boys, the Stanley Brothers and the Clinch Mountain Boys. The banjo solos on the CD, featuring such classics as 'The Ballad of Jed Clampett,' 'Salty Dog Blues' and 'Jesse James' are written out note-for-note in easy-to-follow tablature notation in the booklet enclosed with the album. You listen to the complete version with soloist, then you step in as soloist with the great 'Country Cookin' bluegrass band, featuring fiddle, guitar, mandolin, bass and vocals! The CD features split-channel stereo, with the banjo part on the right channel for easy removal: the left channel contains the accompaniment minus you, the soloist. Soloist: Peter Wemick, banjo.